The federal government was on Thursday ambushed by passengers of Abuja-Kaduna rail line and persuaded to bring down the train fare to N500 for economy class from the N600 it pegged it at with first class going for N900. 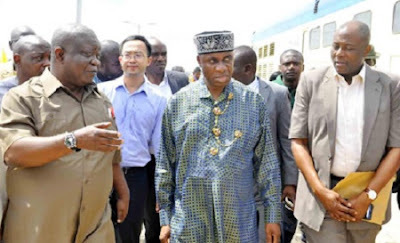 The Minister of Transportation, Mr Chubuike Amaechi who was ambushed by the passengers while on inspection of the rail line, could not but submit to the plea of the passengers who were at the stations in their numbers. Amaechi who led a team of All Progressives Congress (APC) with the National Chairman of Chief John Odigie Oyegun, on inspection tour of the train from Idu station to Jere station and back to Idu in preparation for the flagging off the Abuja-Kaduna rail line come Tuesday by President Muhammadu Buhari.